I wrote a few posts ago about using my Canon SD880IS digital camera as a camcorder. Yes, for those quick moments, I would use the video recorder function. But for those moments that you want to save and share, I would definitely get a camcorder. But there are so many. DVD, miniDV, Hard drive, flash memory. Which one do you choose? It’s all about how much you want to spend and what kind of features are you looking for? 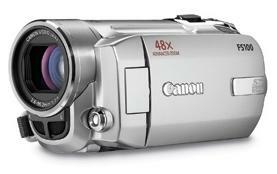 I highly recommend the Canon FS100 Flash Memory Camcorder if you’re looking for a basic camcorder that is portable and reliable. I’ll speak to image quality when I get the actual camcorder. It comes in a few colors, silver, purple (wine red), and blue. $285.95 – $10 = $275.95 (Sales Tax only in NJ) + Free Shipping. Click here to go to the product page. This entry was posted in Digital Camera, Uncategorized and tagged Camcorder, Canon FS100 on January 21, 2009 by admin.